PS: even if reusing some elements, this is not part of my old Fedora comics series, neither is it in any way endorsed by the Design/Art Team, is a personal project. :)) .. resistance is futile :)) I haven't tried gnome shell yet but I did see a few things that I like about it. But it's hard to figure how things work just from pictures.Honestly I don't mind doing away with the desktop as a concept, as long as we replace it with something better. Try it and then make your own judgement... is available for install in Fedora for over a year. Hehe, nice one Nicu. Although I feel it's a little hyperbolic, I share this opinion with you (and yes, I also try gnome shell from time to time and am a Gnome 2.x avid user). I just did try it on Ubuntu. It looks nice in terms of graphics but I'm not sold on the usability. Feels like I'm all over the screen for no good reason. I think graphics designers had their way with it. I have a feeling I'll be moving back to KDE soon. This isn't an accurate representation of the target user for Fedora. bbbzzzzt wrong. I think you greatly underestimate the GSA. 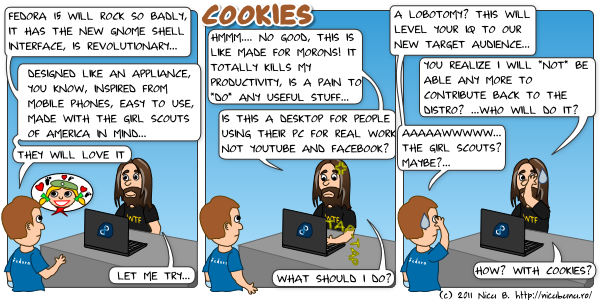 @nicu: I know some intelligent girl scouts, and probably they hate gnome shell too. As far as I have seen, Gnome shell seems to slow down the workflow on the desktop, if that's going to be the default I probably move back to Fluxbox or XFCE, but I'm not going to stop using Fedora because of that, I guess I'll stop using it the way that the developers want it to be used. I installed Fedora yesterday, after very long break from *nix systems. I remember Fedora Core 5, 6, 7 and 8 (8 is my last Fedora before break), as good system for developer and other works. Installed 14 and I see that Fedora is coming to become second Ubuntu, but instead of using DEBs using RPMs. I'll link your blog on my home when I renew it, you're writing good posts. You've said that you've tried it a "couple" of times. Did you use the packaged versions or build it yourself? From my experience the packaged versions don't give an accurate idea of GS b/c of their age. While performance for me hasn't improved for awhile, anecdotally it has for most people. Using alttab works across the desktops so you can keyboard switch easily or use the mouse OR a combination of the two if you are doing graphic design. @Cristoph: I played a week ago with Xfce 4.8 in Fedora 14 using your repo (thanks for that!) but unfortunately I found my main gripes from when I tried 4.6 a year ago are still present. @Anonymous: is not about performance, is the design that is flawed - to switch between two open apps I do NOT need to endure lost of focus, screen zooming and useless anumations. Need for compositing (which makes some apps almost unusable), useless animations, tons of useless mouse movement, useless and continuous focus switching. These are my main gripes with gnome shell. Until things are fixed, gnome-shell is a no-go for me. And believe me, I've tried. I just hope that the "classic" gnome desktop will stay around long enough. Because right now I don't like any of the alternatives. As I said use alt tab. That along with some window tiling allows a decent Amount of flexibility. Jhbuild it Nicu and give it another shot. I've found it quite usable even if it is different. I fear that given your tone with these rants that no matter how GS changes, short of returning to the panel, you will be contrarian. One has to wonder if your dispute stems from some other disagreement.